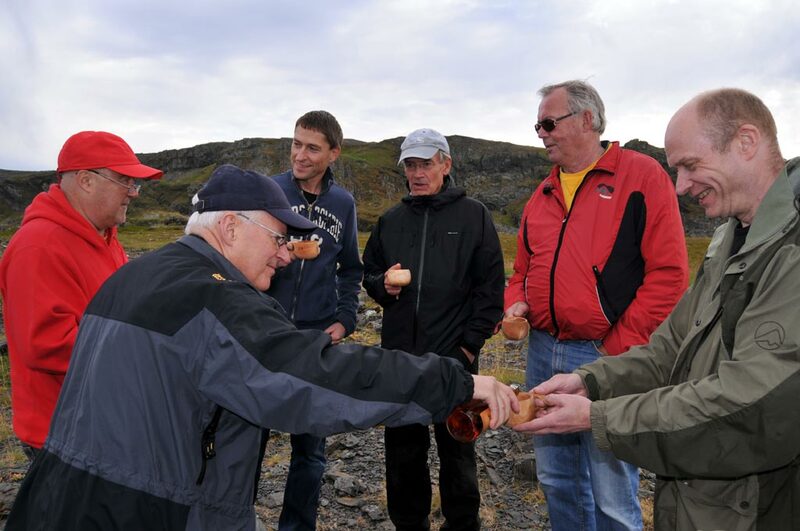 This was my first DXpedition trip with king crab, reindeer fillet and quality wines on the menu. 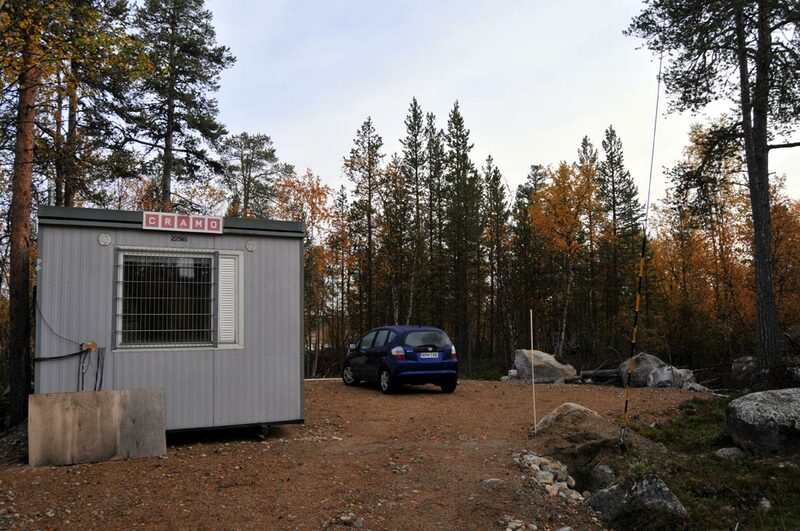 The second annual Arctic DX Summit held in Kongsfjord, Norway, prompted me to spend a few nights of dxing in Aihkiniemi on the way back and forth. The second week of September was so early in the AM dxing season that expectations were modest, and stormy solar conditions didn't exactly improve prospects, but I and fellow DXer Olli Kilpeläinen nevertheless got some nice catches from Australia and the rest of the Eastern Hemisphere. In addition to launching the DX season earlier than ever before, we traveled to our cabin faster then ever. 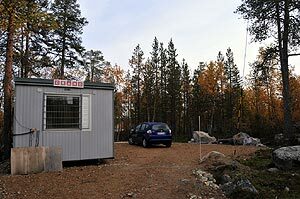 We had visited Aihkiniemi in early August to construct and repair antennas, and left much of our DX hardware there. So, with much less luggage than normally, we were able to fly with Finnair from Helsinki to Ivalo, get a rental car at the airport, and arrive in Aihkiniemi in no time. 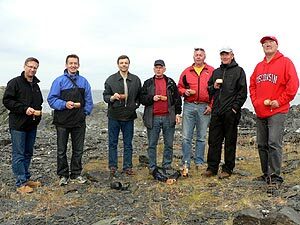 The timing of this DXpedition was dictated by the second annual Arctic DX Summit, an informal gathering of Norwegian and Finnish DXers, held in Kongsfjord, Norway, on September 9-11. 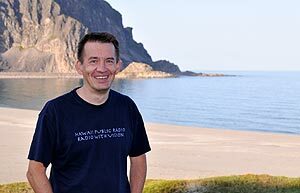 I thought I would take advantage of our cabin in Aihkiniemi on my way to Northern Norway, and Olli Kilpeläinen was happy to join me for this DXpedition that was held exceptionally early in the season. Olli however preferred to stay in Aihkiniemi through the weekend, listening and working to improve our antennas, and didn't join me for the excursion up north. 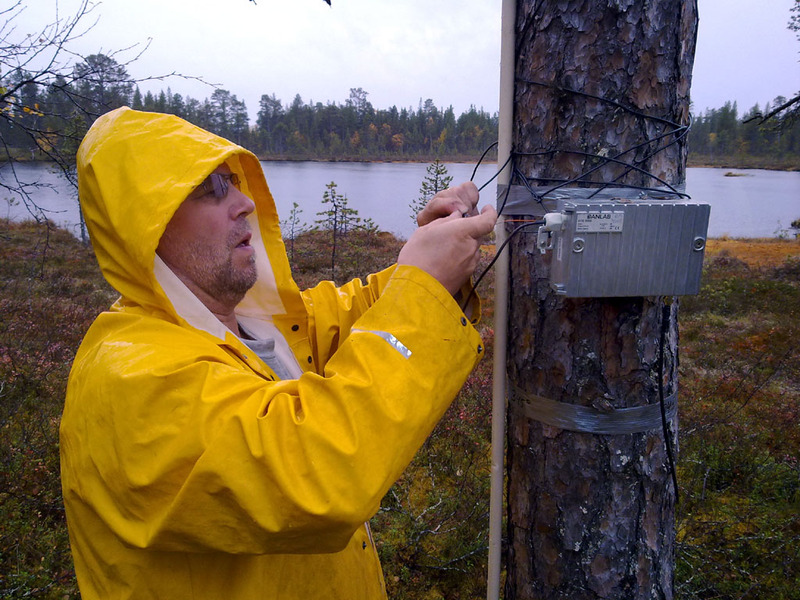 Baluns in Aihkiniemi were still a work in progress, so not all antennas were usable, but antennas pointing to the Eastern Hemisphere were the first ones to be fixed, so by the evening we were able to scan the dial for some South Asian stations. This was the first time that the new 100-degree antenna was in use, and it immediately proved to be great in enhancing signals from India and the surrounding countries. Nepal on 792 kHz was so strong that I expect to identify some new stations from the region once all the sound files are checked. Time for some Arctic Exposure in addition to the regular Northern Exposure. In addition to me, six other Finnish DXers were traveling to Bjarne Mjelde's DXing base in Kongsfjord, and had stayed overnight in Utsjoki. I woke up early on Friday morning to catch up with them somewhere along the way. I drove from Näätämö to the Norwegian side of the border, aptly called Finnmark, and happened to reach Tana bru at the same time as the rest of the Finnish contingent in their rental van. We arrived in Kongsfjord by midday in unseasonably warm, calm and sunny weather. The village of Veines. I stayed in the red house that is third from the left. We stayed at Kongsfjord Gjestehus, a beautifully restored old guest house in the tiny village of Veines, about a kilometer north of the Kongsfjord fishing hamlet. A colorful collection of traditional wooden houses sits on a narrow isthmus with water on both sides. Norwegian DXers Bjarne Mjelde, Odd-Jørgen Sagdahl and Tore Johnny Bråtveit hosted the second "Arctic DX Summit" at Bjarne's famous blue house, located close to the shore on the Veines Peninsula jutting into the Barents Sea. The location is rugged and barren, but stunningly beautiful, which I hope to convey with the photos. We walked along the Beverage antennas, which end right at the sea. Especially the 50-degree antenna wire, the tool that has resulted in a record haul of New Zealand stations on this continent, has a very impressive ending next to sharp-edged rocks on the shore, with an open sea view. Below the horizon lies a thick slice of Siberia, but otherwise the next stops would be Hokkaido and the North Island of New Zealand! The sea is known to boost AM signals considerably, which definitely puts inland locations such as Aihkiniemi and Lemmenjoki at a disadvantage. On the other hand, we have space for longer antennas, which should roughly balance the outcome. 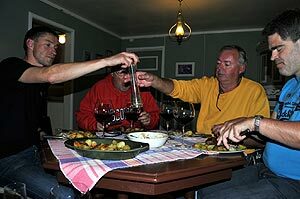 Receivers were opened in the evening, but more importantly, so were quality wine bottles. I can't remember how many, but I can remember that the reindeer fillet was exquisite! The weather continued to be excellent for photography and any kind of outdoor activity. 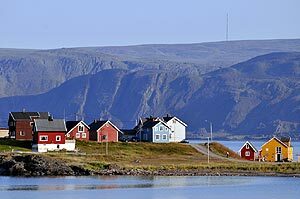 The fishing village of Berlevåg at the end of the coastal road was chosen as destination for an afternoon outing and some shopping. 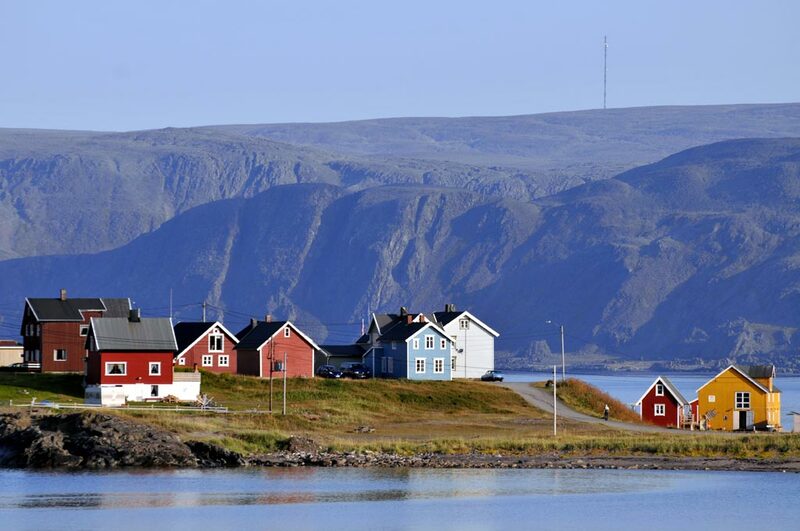 This is as far north as you can go in the Varanger Peninsula, and views along the road are superb. Reminds me very much of Highway 1 in California. 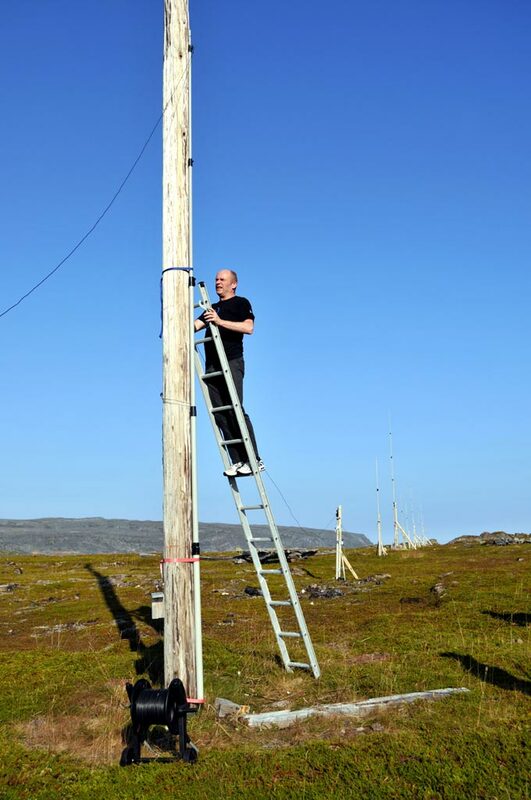 Between Kongsfjord and Berlevåg there is a tall antenna mast up on the hills, used as part of the LORAN-C terrestrial radio navigation system. Their constant beeps on 100 kHz are aired at a power of 250 kW, which is a major nuisance for DXers nearby. It is quite strong in Aihkiniemi as well, which is why any recorded frequency range should begin well above 100 kHz. Oh well, I guess not all radio-related installations are meant to support our noble hobby. This was no weight-watchers group, so in the evening we once again feasted on local delicacies, with king crab on the menu. 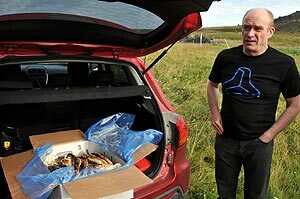 Bjarne had bought an enormous box of frozen crab, which I last had a few years ago in Alaska. Although king crab is a Russian-introduced invasive species, at least it tastes great, and has become an important catch for the fishermen all along the northern coast. I wish it would be more readily available in Finland as well, although it is outrageously expensive, as everything in Norway is nowadays to anyone who is not earning a salary in Norwegian krones. We all left Kongsfjord around midday, and I returned back to Aihkiniemi well before sunset with high expectations, but it wasn't before 1700 UTC that I needed to switch the Perseus recording function on. Even then it seemed that the Middle East was going to dominate the evening, but I paid attention to an unknown station relaying BBC World Service on 1152 kHz. A brief search on the Internet revealed that this had to be 6PNN Busselton WA, with ABC News Radio programming. It didn't take long before I got the first ABC News Radio station ID at 1929 UTC. Newscasts were filled with reports from Ground Zero on the 10th anniversary of the 9/11 terrorist attacks. Based on the strong signal I expected that a review of my recordings would reveal also other stations from Western Australia, and that indeed turned out to be the case, with some very impressive signals from the westernmost tip of Australia. Before this DXpedition I had only caught a couple of X-band stations from Western Australia, but now there was nothing on the X-band. As always on this DXpedition, we counted on Ilpo Parviainen's fabulous Mestor software to record the overnight top-of-the-hour station identifications from the Western Hemisphere. I have tried other automated recording options with Perseus, but there have always been some problems. Maybe it is just me who doesn't know how to properly use them. In any case, the crucial difference with Mestor and all the rest is that Mestor doesn't launch Perseus software (but nevertheless uses Perseus hardware, don't ask me how), which eliminates all problems related to Perseus software possibly freezing. 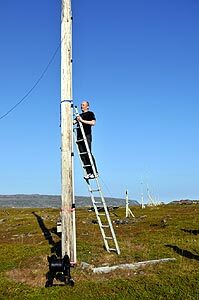 Daytime was spent on miscellaneous antenna work with Olli. The evening conditions were lousy, favoring Iran and the rest of the Middle East, but with the unparalleled antenna array currently available in Aihkiniemi, I still expect to find something interesting once all the recordings are reviewed. On Tuesday morning we packed and set up three receivers to record the highlights of the sunset period from the Eastern Hemisphere, and one receiver to record a wire a pointing to the U.S., which we planned to run until the end of September. Later on Jim and Håkan decided to come over for a week of DXing on September 17-24, but our recordings resumed for the last week of September, as Olli and Yrjö traveled up there for a brief visit. Regarding the first session of automated recordings running from August 11 to September 7, using a single antenna pointing at 70 degrees, a few observations can be made. First, good signals from stations in Eastern Asia can be received quite early in the season. We had Chinese and Taiwanese stations with impressive strength already on August 21, and conditions to China and the Philippines were excellent on August 30. Interestingly, on several days there were stations from the province of Shaanxi that I have never heard during the winter. Australians were heard from August 18, and the first Japanese station was heard on August 30. Of course, on most evenings stations from the Middle East (and naturally Europe) tended to dominate. In theory we should have fairly good data to analyze the occurrence of good reception conditions in August and September as our automated recordings spanned an exceptionally long period. Of most interest in this sense is whether we can find any correlation between the solar weather and reception conditions to Australia, a favorite target area for many DXers. The Australian stations heard were almost exclusively from Western Australia. It is worth noting that (with one exception) stations in Western Australia were stronger on the 100-degree antenna than on the one pointing at 70 degrees. We are able to compare these only from September 8 onwards. Eventually I found ABC Local Radio on the frequencies of 558, 684, 720 and 828 kHz. My reports were confirmed by Glynn Greensmith, who hosts the morning show "Dawn Patrol" which is heard all across Western Australia. Glynn asked me to be on the air with him, and so on October 5 we talked about Finland and DXing to an audience of potential future DXers, I mean, who else would be listening to the radio already at 4 a.m... You can hear a 10-minute excerpt of the show here (MP3). To help draw conclusions, I have compiled the following table of solar indices, and marked in pink the days when at least one AM Aussie was heard. Reception to Australia was best on the 10th anniversary of 9/11, marked in red. Interestingly, that particular day was soon after the most severe magnetic disturbance of the recorded period. Otherwise, it is difficult to say whether there are patterns that can be distinguished. One extremely interesting discovery was a New Zealand station on 783 kHz logged already on August 31. This is clearly the earliest in the season that a Kiwi station has ever been identified in Scandinavia on the AM band. 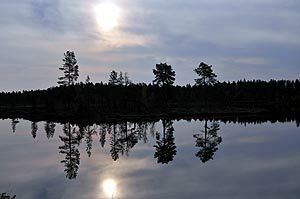 At this time of the year the sun rises in New Zealand roughly at the same time as the sun sets in Aihkiniemi, and the path in between is in darkness. I even had a completely wrong antenna (70 degrees, although 30 degrees would have been best), so I can only presume that quite a number of Kiwis would have been audible with the right antenna. At the time of writing this, I have reviewed automated recordings until the end of August. The table below will be updated, and corresponding observations will be added here, once we get a feel of the conditions and recordings of the beginning and the end of September. A detailed log will be published when recordings have been reviewed. 2.10.2011 130.9 164 92 11.1 11 4-15 12333323 13342312 389-518 5 2 . 1.10.2011 136.9 144 86 9.0 9 4-15 32331212 44222223 405-545 3 1 . 30.9.2011 138.1 195 89 7.6 8 0-27 10001144 21011223 427-564 4 1 . 29.9.2011 133.4 139 116 23.9 24 4-48 34555312 65432322 429-587 4 . .
28.9.2011 133.4 139 116 23.9 24 4-48 34555312 55543332 390-529 3 1 . 27.9.2011 139.0 157 82 30.1 30 7-111 74434234 64434334 483-708 8 . .
26.9.2011 148.2 147 114 58.8 59 2-207 10015884 21125654 319-674 9 1 . 25.9.2011 168.8 172 108 4.4 4 2-9 10021212 11022322 282-370 4 8 . ...... . . . . . . . . . . . .
17.9.2011 144.8 254 138 32.4 32 2-80 03346643 13444532 346-535 2 . .
16.9.2011 143.1 275 173 2.1 2 0-4 10001101 11012221 347-453 13 . .
15.9.2011 140.7 262 167 5.4 6 3-9 12111122 13212222 406-471 11 . .
14.9.2011 142.6 278 144 4.4 4 3-7 21111112 22122222 453-557 8 . .
13.9.2011 129.4 254 118 16.8 17 5-32 44432113 44432222 492-585 6 . .
12.9.2011 123.9 244 97 26.8 27 18-39 44443445 44444334 559-636 7 . .
11.9.2011 121.3 205 94 9.4 9 3-18 32113213 32213313 539-608 4 . .
10.9.2011 116.2 131 77 33.4 33 12-56 55443435 55443535 433-579 2 1 . 9.9.2011 111.8 95 65 35.5 36 0-132 11005755 12015644 284-499 3 2 . 8.9.2011 110.1 83 47 3.6 4 2-7 12000111 22111310 293-362 3 1 . 5.9.2011 118.7 151 102 5.5 6 2-9 20102222 10112322 299-403 10 2 . 4.9.2011 119.4 188 114 8.4 8 3-15 23212232 23112321 307-402 3 2 . 3.9.2011 118.7 181 139 12.5 13 6-18 33232333 33242212 291-426 7 . .
2.9.2011 115.4 207 103 2.8 3 0-6 02001111 12111121 271-302 1 . .
1.9.2011 111.8 188 119 3.0 3 0-5 11001111 11002101 274-338 2 . .
31.8.2011 109.0 201 121 2.4 2 0-4 00101101 10102221 324-365 1 . .
30.8.2011 101.3 167 89 4.0 4 0-6 10012121 21112311 348-431 5 . .
29.8.2011 101.2 134 66 9.3 9 2-15 30332232 21332222 381-550 4 . .
28.8.2011 101.0 115 73 5.6 6 4-7 21122122 11222222 350-447 . . .
27.8.2011 103.8 101 63 4.9 5 0-9 20002222 20112211 336-424 . . .
26.8.2011 104.6 144 76 3.1 3 0-7 10011121 00011212 346-425 2 . .
25.8.2011 104.2 122 97 4.3 4 0-7 20012122 10012221 367-483 . . .
24.8.2011 104.1 120 75 5.9 6 0-15 31012202 32112212 443-560 . . .
23.8.2011 103.7 139 81 9.3 9 0-22 30112243 20213333 339-529 . . .
22.8.2011 108.2 121 82 6.8 7 0-15 20201233 20311122 343-431 1 . .
21.8.2011 100.9 123 66 3.4 3 0-7 10002121 10012221 338-411 2 . .
20.8.2011 100.5 101 59 5.0 5 0-15 11002123 11101223 347-383 1 . .
19.8.2011 98.2 85 46 2.1 2 0-5 00000001 00111211 337-378 . . .
18.8.2011 97.8 80 53 2.8 3 0-6 10001121 10002211 355-408 3 . .
17.8.2011 97.5 101 44 6.4 6 4-12 31212111 31312121 374-445 4 . .
16.8.2011 93.0 97 26 7.9 8 6-12 22223122 23322221 494-630 . . .
15.8.2011 90.4 72 13 12.9 13 4-32 43122333 53122323 403-491 2 . .
14.8.2011 88.1 45 0(?) 9.1 9 5-18 22221223 23221223 325-475 . . .
13.8.2011 83.1 58 35 4.9 5 0-12 12101113 12201123 287-362 . . .
12.8.2011 83.4 51 25 5.1 5 3-9 12121122 12122221 352-379 . . .
11.8.2011 84.2 61 36 5.6 6 4-12 11111123 12212212 354-454 2 . .
10.8.2011 90.3 109 43 7.0 7 2-18 22321021 22431111 449-557 5 . .
8.8.2011 101.5 87 80 10.5 10 6-15 33233222 23233212 451-588 4 1 . 7.8.2011 105.4 105 89 7.0 7 3-18 32211112 32211122 444-584 7 . .
Our DXpedition was probably the earliest ever in the fall season held in the far north. A lesson to be learned is that there is no reason to shun such an early timing. The weather outside, the solar weather, and most importantly, conditions for long-distance AM reception, can be quite favorable already during the second half of August. Listening times are much more limited than in the winter, but in the Perseus era, it really doesn't matter. What counts is that early in the season the dusk and dawn peaks are sharp. 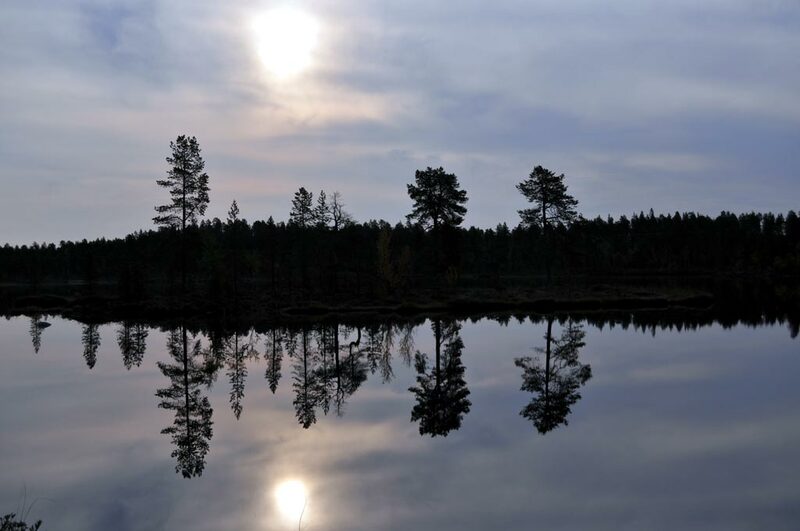 In terms of antennas, the Aihkiniemi cabin is now in excellent condition (11 Beverage antennas totaling almost 11 kilometers in length) and can offer truly memorable catches. 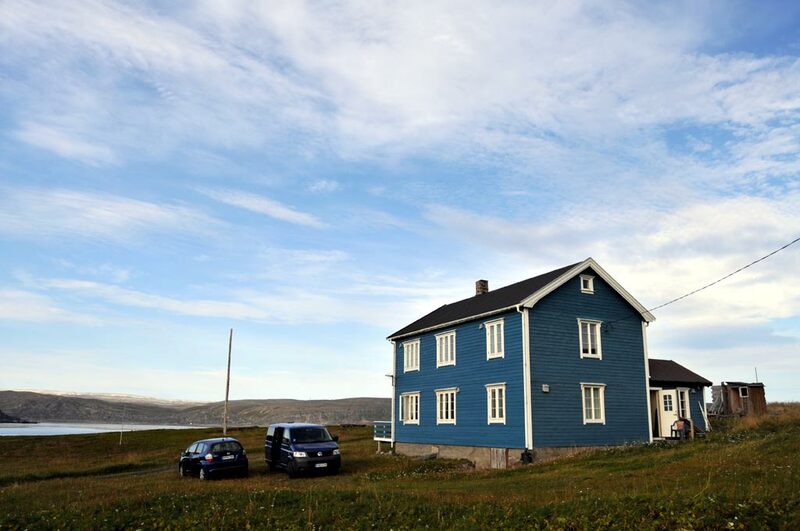 If you're interested in renting it for your DXpedition, check out an introduction article. 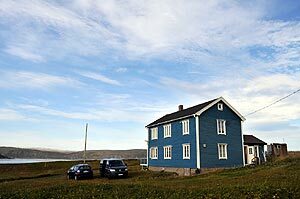 At the time of writing, the cabin is booked almost solid until the end of 2011, but many vacant weeks are available starting January 2012. I can hardly wait to get back there for my next DXpedition in mid-October.